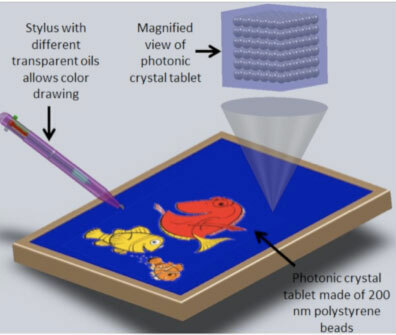 Photonic crystal tablets - the future of iPads? (Nanowerk Spotlight) Many animals – think butterflies and peacocks – get their beautiful colors not only from pigments, but also from nanoscale structures that manipulate light. As a matter of fact, such 'structural color' – where the color results from interferences, not pigments – is ubiquitous in nature. When light is incident on a crystalline structure with appropriate periodicity, some colors will be preferentially reflected. This success in nature has inspired researchers to develop numerous methods for incorporating structural color, i.e. the use of surface architecture without using chemical dyes and without altering the chemical composition of a material. These photonic crystals and the structural color they generate represent an interesting method for creating reflective displays and drawing devices since they can achieve a continuous color response and do not require back lighting. Structural color is a natural fit for new display technologies and writing substrates since it can provide vivid colors in environments of high intensity light (e.g. sunlight) without the need for additional illuminating power. "Most existing display technologies such as LCDs and LEDs require power to actively project colors and often suffer from performance degradations in these reflective environments," Pilgyu Kang, a Ph.D student in David Erickson's Integrated Micro- and Nanofluidic Systems Lab at Cornell University, tells Nanowerk. "Recognizing this, researchers have developed a number of techniques for dynamically and spatially modulating the colors reflected off of photonic crystal-like substrates, for example, using electrical and magnetic actuation methods. The application of these external fields to drive the color change can be fast and provide good dynamic range but they require external power, an embedded method for spatially modulating the field, and are not directly applicable to writing substrates." In new work by Erickson's group, the Cornell team has demonstrated an electrical-power-free infusion technique that allows them to draw multi-color images on colloidal photonic crystal (CPC) substrates using transparent imaging oils. A paper with the findings, first-authored by Kang, has been reported in the July 18, 2011 online edition of Langmuir ("High Resolution Reversible Color Images on Photonic Crystal Substrates"). This novel technique could find applications in the development of new flexible and stretchable drawing substrates and low power reflective display technologies. "Our method allows the fabrication of erasable, high-resolution color images using otherwise transparent inks on self-assembled photonic crystal substrates" explains Kang. "Using inkjet printing, we show the ability to infuse fine droplets of silicone oils into the crystal, locally swelling it and changing the reflected color. We obtained multi-color images with resolutions down to 200 µm from oils of different molecular weights with the lighter oils being able to penetrate deeper, yielding larger red shifts. Erasing of images is done simply by adding low vapor pressure oil which dissolves the image returning the substrate to its original state." The substrate is returned to the original color without a trace of the original image. The erasing procedure takes less than 10 seconds after the erasing oil is applied. Kang notes that the team has been able to use this procedure in excess of 30 times without the degeneration of the original substrate or reduction in the quality of the reproduced images. "Our CPC substrate can be reused in the writing and erasing cycle without degradation unless the photonic crystal structure in PDMS matrix is physically damaged, for example by scratching" he says. "For a potential application as writable display additional PDMS layer on top of the CPC substrate could provide greater robustness. This could however increase the diffusion time for the oils and slightly degrade the image quality due to the additional diffusion distance." In their test prints, the researchers demonstrated uniformity – which is a key requirement for displays – for substrate areas as large as 5 x 7 cm2. For many commercial applications, though, a larger area is preferable. Kang points out that the self-assembly method shown in the team's research is the simplest approach for the fabrication of colloidal photonic crystal substrates. However, this self-assembly technique is not an effective method for practical applications in terms of high fabrication speed and large-scale uniformity. Other fabrication techniques such as spray coating, dip coating and wire-wound rod coating have already been developed for commercial applications. These methods could potentially also improve the fabrication process for the team's CPC substrates.